The one who is often weary. Whose child constantly pulls at her shirt and needs her attention. Her schedule is filled with visits to speech therapy, counseling appointments and nutritionist visits. She always wonders if she's doing enough. She rarely feels that she is. She stays quiet, head down and distracted by the swirls of cream in her tea when other moms begin to share about their children's academic successes and even more when they share about the stress they face. She dreams of issues that in comparison to what she is carrying, seem so small. The one with the charming grin, the passionate smile, the eyes that light up any and every room. The child who wiggles and runs with abandon, even when the world tells them its time to be still. This is the child who can only wear cotton, who needs the tags cut out of every shirt because they are "itchy," the child who can't stop washing their hands and is afraid to hug you, afraid to embrace the world because they fear what might stick to their little bodies, fear growing in their little hearts. You know this child that is bursting with bright ideas and can't form a sentence with their pen, who loves stories and can't find a way to finish reading even one page. Maybe this mom is you. Maybe this child is yours. Maybe you feel alone. Isolated as you face different challenges silently. Maybe you think there is not anyone who could ever understand. You hold hopes and dreams for your child, you see how wonderful God has made them, but you wade in fear. You are desperate for hope. Desperate to know that God is in their story, and yours, and that there is a path of grace that will bring a life and a future that is flourishing. 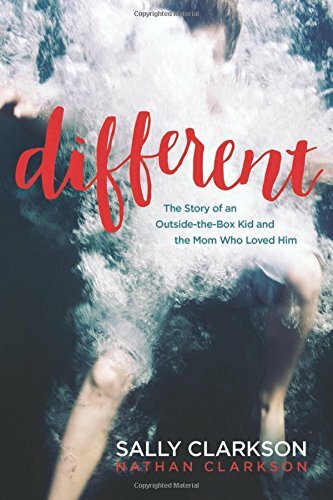 Sally and Nathan Clarkson are my dear friends and they have written a book, Different, bravely sharing their story of what it was like for Nathan to be different growing up with ADD, OCD and ODD, and what is was like for Sally to be the mom who loved him and nurtured him. I don't know of any other book that shares this relationship between mother and child with such candor,that guides the way, and that offers such insight into the mind of a child experiencing these challenges. God's glory shines in their lives and in their words, not in spite of these differences, but because of them. If you are a mom like Sally, or if you know one, I hope these words are a balm to your heart.